An international team of researchers has found genetic evidence that suggests dogs may have been domesticated as far back as 32,000 years ago. 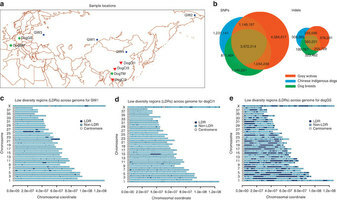 In their paper published in Nature Communications outlining their study and results, the team theorizes that dogs indigenous to China might represent the missing link in the domestication of dogs. Scientists have long studied the close relationship between humans and dogs, and various theories have been proposed to explain just how far back in time the relationship goes. Most agree that dogs and humans have coexisted for at least 16,000 years. In this new effort, the research team suggests it might be twice that long. To better understand when dogs first became domesticated, researchers look to when they diverged from wolves—experts estimate it occurred sometime between 16,000 and 32,000 years ago. To come up with a more accurate estimate, the researchers took DNA samples from indigenous Chinese street dogs, several modern breeds and four grey wolves. An analysis of the samples indicated that the grey wolves split from the Chinese dogs approximately 32,000 years ago. But then the researchers went further—they also looked at the genes responsible for such things as digestion and metabolism and even neurological processes. They then compared the dog genes to the same types of genes in humans. In so doing, they found some similarities that suggest humans and dogs have evolved some of the same traits over the same time period—hinting at a possible communal relationship. And that, the researchers say, suggests that dogs might have been domesticated as far back as 32,000 years ago. The researchers note that scientists have long held the notion that domestication of dogs and other animals has been associated with people and animals living in close quarters in relatively tight communities. Such conditions, they contend would almost certainly have a similar impact on people as well as the animals living in the same environment. They note that dogs, for example, in addition to exhibiting similar genes, also suffer from many of the same kinds of diseases, e.g. breast cancer, obesity, epilepsy and even obsessive-compulsive disorder. The evidence found by the researchers offers only circumstantial evidence of course, which means more research will have to be done before the time of dog domestication can be officially pushed back. Figure 1: Sampling and diversity information of the dog and wolf individuals.